Pugnacious, determined, sometimes unbearably rude, Fiorello LaGuardia (1882–1947) seemed to some in his time to be a living symbol of New York. His sensibilities, though, were those of a frontier crusader; born in Arizona during the Apache wars, he learned in the territories “to despise purveyors of racial hatred and ignorance,” writes Brodsky (Grover Cleveland, 2000), “and to identify with the underdog and the downtrodden.” After serving as a US consul in Trieste, LaGuardia made his way to New York determined to make his name as a reformer. Though it can be argued that he changed a few belts in the machine rather than scrapping it, he proved to be a champion of labor and the poor over several terms in the US Congress, where, among other things, he cosponsored legislation to restrict local courts’ powers to interfere with labor strikes or picketing. 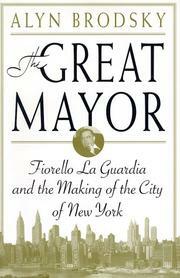 Elected mayor of New York in 1933, LaGuardia forged out of the five boroughs a united metropolis whose government was so well-organized that the city was allowed to administer its own federal-relief programs during the Depression, giving it in effect status as a state. Brodsky is sometimes overawed by LaGuardia, whom he considers to be “the last great paradigm of honesty and incorruptibility in American political history,” but he makes a good case for the Little Flower’s many virtues as a leader and human being even as he is moved to wonder why no one seems to remember LaGuardia except as the guy an airport is named for. A fitting memorial: solid, well-researched, and full of ably reconstructed plot turns, worthy of a place alongside Robert Caro’s The Power Broker on the long shelf of good books devoted to New York politics.